Summary: The Guardline GL2000 wireless driveway alarm is one of the best on the market in terms of detecting people and vehicles. It has great range and a top of the line motion detecting sensor. The Guardline GL2000 driveway alarm was designed as an all-in-one solution: it detects vehicles and people. You can also add up to 4 sensors in order to monitor different areas of your property. 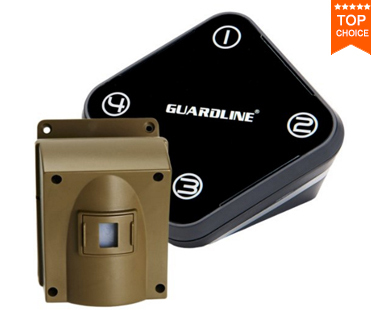 The Guardline GL2000 comes with one sensor, one receiver, AC adaptor and mounting hardware. You will need to by the batteries separately: 4 AAA batteries for the receiver (which can also work with the AC adaptor included in the package) and 4 AA batteries for the sensor. The sensor will transmit a signal to the receiver whenever an animal, person or vehicle is detected. You will then be notified by either a sound, a flashing LED, or both, depending on how you have the receiver set up. Install the sensor in a well protected area, preferably away from sun and wind. The sensor can be mounted to posts, walls, fences and trees. If you’re looking to get notified whenever you have an unexpected guest or when a car pulls into your driveway, The Guardline GL2000 is one of the best driveway alarms on the market. It comes with all the bells and whistles (low battery indicator, flashing LED lights, several ring tones, etc…), it has a great range and a high quality sensor that make false alarms a thing of the past. If you are looking for a car alarm that will detect cars only, check out Dakota Alert 2500.